Morton's of Omaha Beef Pot Roast — I Am Tired of Cooking! Update 11/06/17 Morton's of Omaha Beef Pot Roast is only available through Costco, but it is no longer available in Texas and other areas of the country. If you are unable to find it in your area and are disappointed, you can leave feedback with Costco at the customer service center or via their website https://www.costco.com/. The "feedback" button appears vertically on the right-hand side of the home page. Morton's of Omaha Beef Pot Roast is your answer to a quick, delicious meal. It is a breeze to add your favorite sides to this pull-apart tender pot roast. It is fully cooked and heats up in the microwave in 10 minutes in the provided microwavable tray. There are directions for heating it using the "boil in the bag" technique. Like gravy with your pot roast? No problem, Morton's has that covered too! I add some water to my gravy to make it go a little further to cover leftovers for lunch the next day. The roast is sold by the pound. A typical roast costs between $13 and $15 dollars. The cost of rice or egg noodles as a side is about $2. Add fresh vegetables or a salad for under $4. So, for serving 4 to 6 people, you are looking at spending between $18 and $20, unless you have some left over potatoes and carrots, which will bring the cost down. We eat smaller portions at my house, so I will get 8 servings. Leftovers reheat easily in the microwave at 50% power in 30 second increments until it reaches the desired temperature. Add a little water to get the juices flowing! 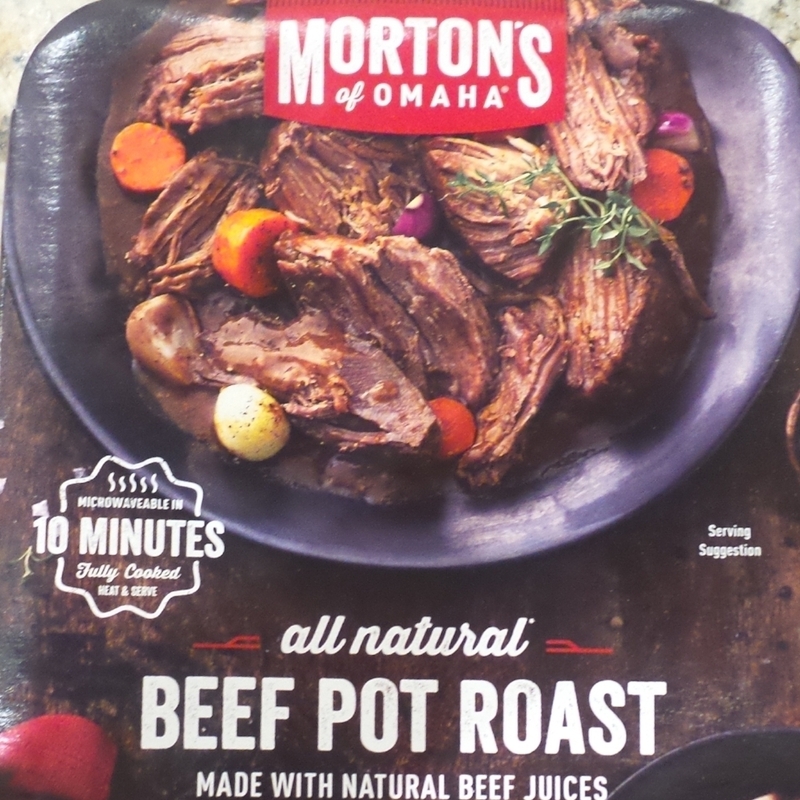 Morton's of Omaha Beef Pot Roast is all natural and does not have any artificial ingredients. It is a solid roast, with very little fat. It has a shelf life in the refrigerator of about 2 months and can be frozen for a longer period. You can even heat it up frozen, but you will have to double the heating time. Morton's of Omaha Beef Pot Roast can be found at Costco. For information about becoming a Costco member, visit their website at costco.com.